Elegant all-rounder. Samsung has big plans with the Chronos 700Z5A: Besides gaming capable midrange hardware, a strong battery that is to ensure a runtime of up to nine hours rests in the compact case. 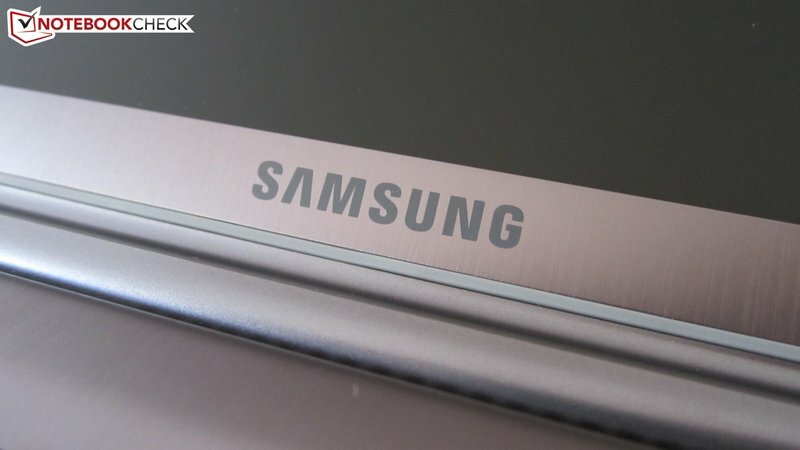 Find out in this review if Samsung is manufacturing a new multimedia reference. 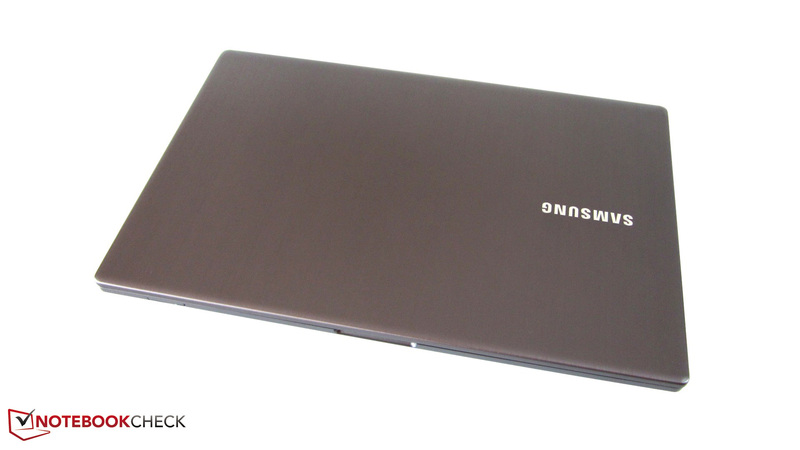 Samsung addresses several buyer groups at the same time with the 15 inch Chronos 700ZSA. While the matt HD+ screen primarily aims at office users, the powerful midrange components are to make entertainment fans curious. Users who are frequently on the move and thus rely on a long battery life will be happy about the medium case dimensions and the strong 8 cell battery. Currently, there are two different versions of the versatile notebook available in Germany. The 700Z5A-S01DE, which we reviewed here, is sold for about 1000€ and is equipped with a six GB DDR3 RAM, a 750 GB HDD and a cutting edge dual core CPU from Intel (Core i5-2430M @ 2.4-3.0 GHz). The approximately 400€ more expensive 700Z5A-S03DE is only worthwhile for users who absolutely want to have a quad core processor. Intel's brand new Core i7-2675QM clocks with 2.2 to 3.1 GHz under load. Moreover, the RAM has a capacity of eight rather than six GB. Both have the graphics card in common: The Radeon HD 6750M is a DirectX 11 capable midrange model from AMD. 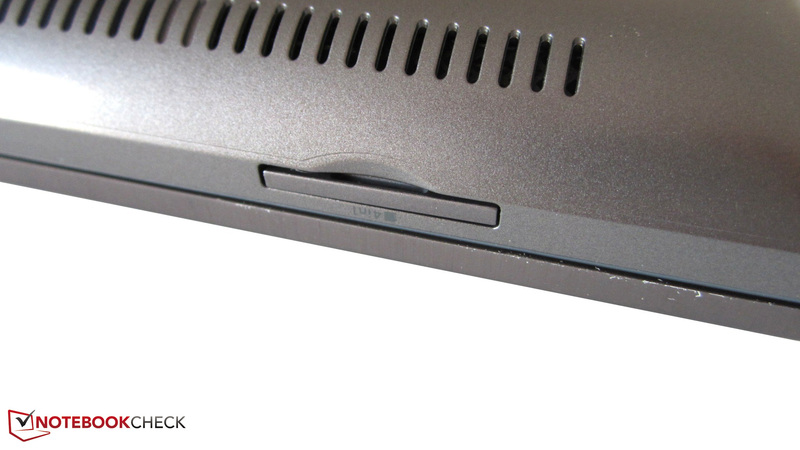 A conventional DVD burner is used as the optical drive (slot-in) in both devices. We think a great job has been done with the Chronos 700Z5A's looks. Design and shape make a simple yet elegant impression. 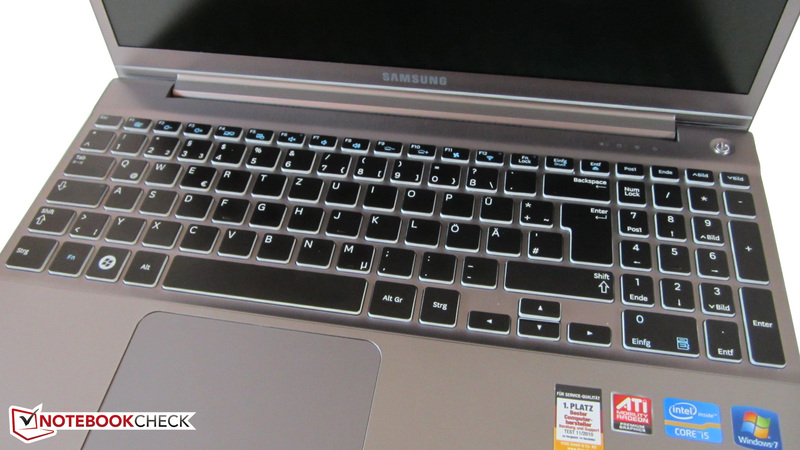 The silver-gray surfaces give the 15 inch laptop a fresh appearance. 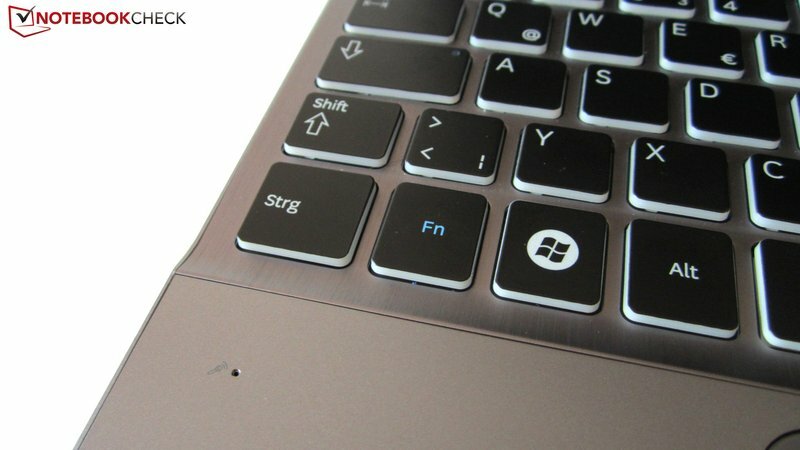 The case hardly smudges due to the matt finish; in contrast to glossy representatives, it isn't permanently covered by dust and fingerprints. The device isn't as scratch-sensitive either. Since the display lid and keyboard area are made of aluminum, the material looks good despite the numerous plastic parts (bottom & wrist rest). Looking closer, the case proves to have a few weaknesses after all. For example, the workmanship is overall above-average, but the screen shone through at the outer edge of the display frame. The biggest point of critique is the mediocre stability. The top not only evidently yields in the drive and touchpad area, but also towards the center under strong pressure. Furthermore, the lid can be severely warped. It's probably easy to break the screen with enough force. Merely the bottom proved to be fairly rigid. 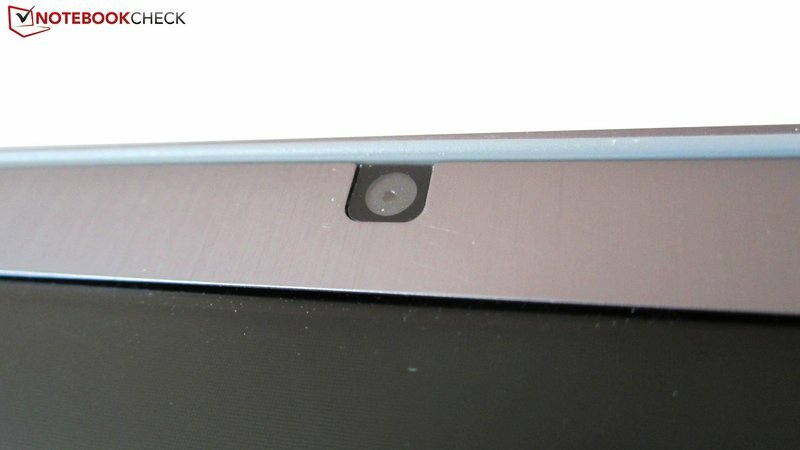 Another flaw is the wobbly hinge that doesn't keep the screen in position properly on vibrating surfaces. However, the compact dimensions can reassure us again: 362 x 238 mm sooner remind of a 14 inch device. A height of 25 millimeters also earns appreciation in view of the installed components. Additionally, there is the moderate weight of 2.4 kilograms. The notebook is well suitable as a travel or university companion - the slim case will attract many envious glances. 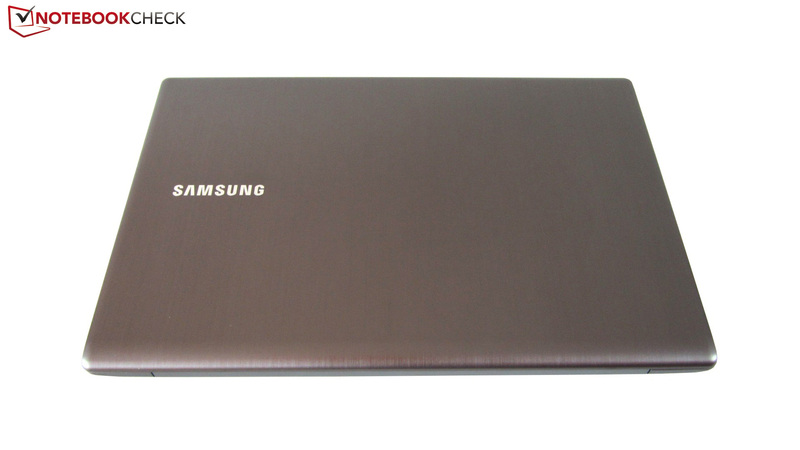 Nevertheless, it is not the equal of a MacBook rival. The Apple products play in a different quality league, though certain case parts of the Chronos strongly remind of them. The scope of interfaces can't exactly be seen as a chart breaker. Unfortunately, there is no FireWire or eSATA port installed. 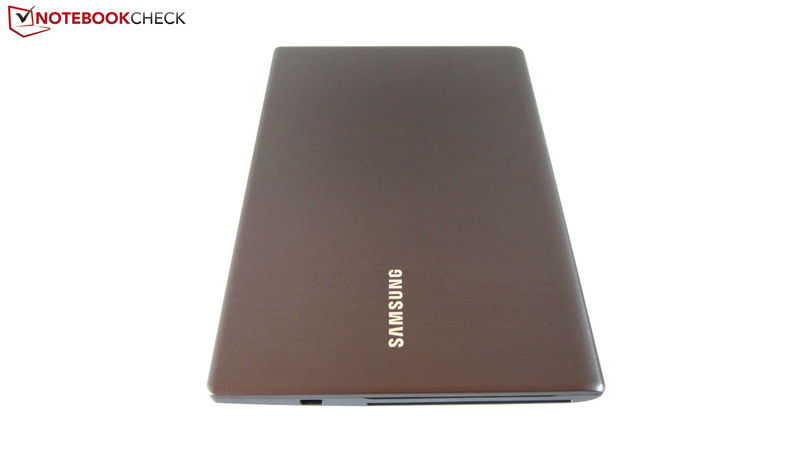 Three USB ports are also a bit scanty, whereby Samsung has at least built-in 2 USB 3.0 ports. 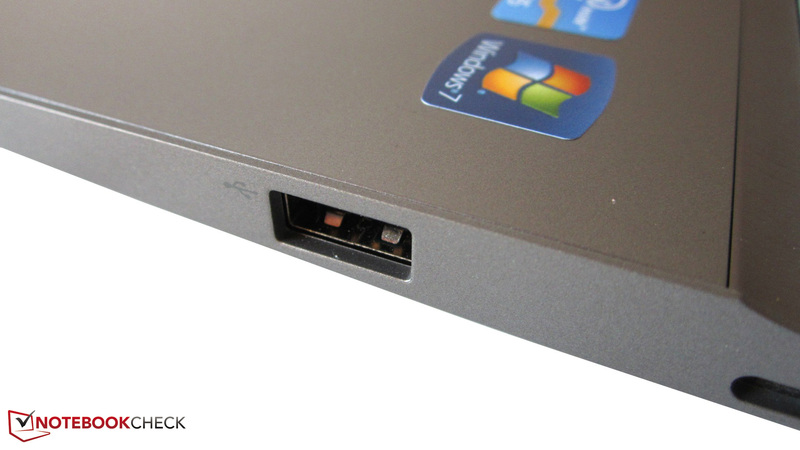 A Kensington Lock, a HDMI out and a card reader (four formats) are standard in notebooks anyway. By the way, the RJ45 Gigabit LAN port has a cover due to the slim build. Also nice: External monitors can be optionally connected via VGA with the included adapter. The microphone and headphone (unfortunately) have to share a jack; the user doesn't have the option of using a surround system. On the other hand, there's no reason for complaint in terms of interface positioning. Since most ports are in the left rear area, the use of a mouse isn't obstructed. Naturally, it's possible to go on the Internet wirelessly. The Chronos 700Z5A supports WLAN b/g/n and Bluetooth 3.0. 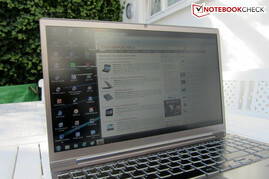 Samsung has opted for the 64 bit version of Windows 7 Home Premium as the operating system. 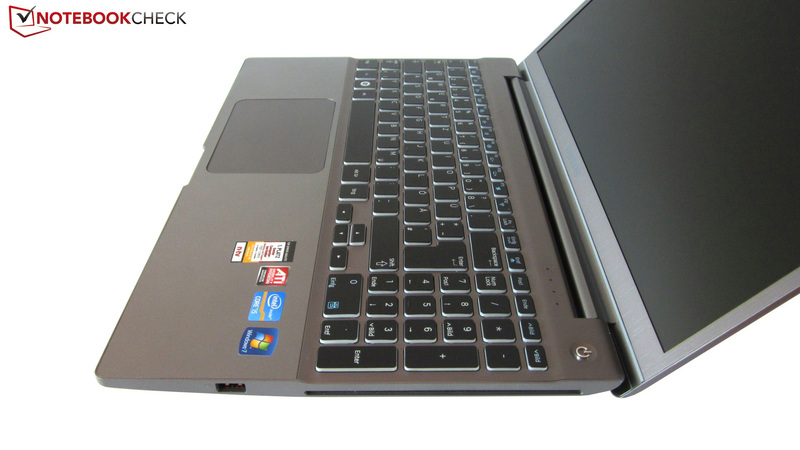 In comparison to other manufacturers, the laptop isn't "stuffed" with software - unnecessary ballast is kept within limits. A tool called "Easy Settings" is worth mentioning. It can be conveniently enabled with a key combination (FN + F1) and allows direct access on various features, such as the USB charger or the "Battery Life Extender" (battery is charged to a maximum of 80%). Picture, sound, network and energy profile can also be configured there. The scope of delivery is very impressive. 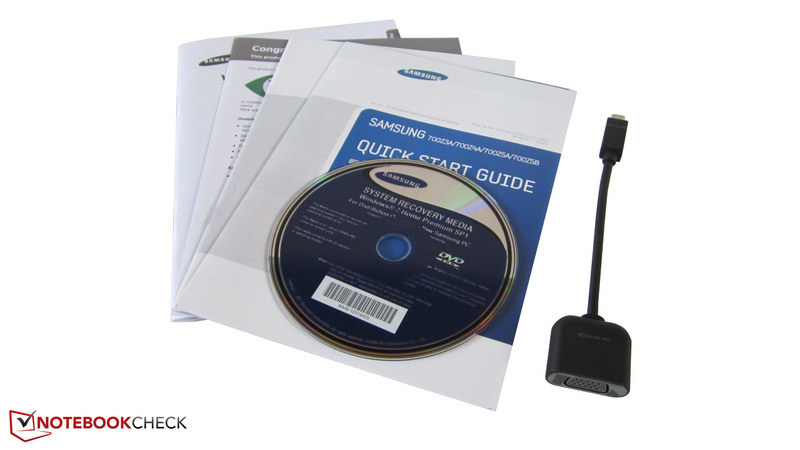 In addition to a small 90 watt adapter (light 344 grams) and the aforementioned VGA adapter, Samsung also includes a manual and a quick start guide in the box. The manufacturer has even remembered to add a recovery DVD - great. Unsurprisingly, the warranty period is 24 months (can be extended to 36 or 48 months within the first 90 days). 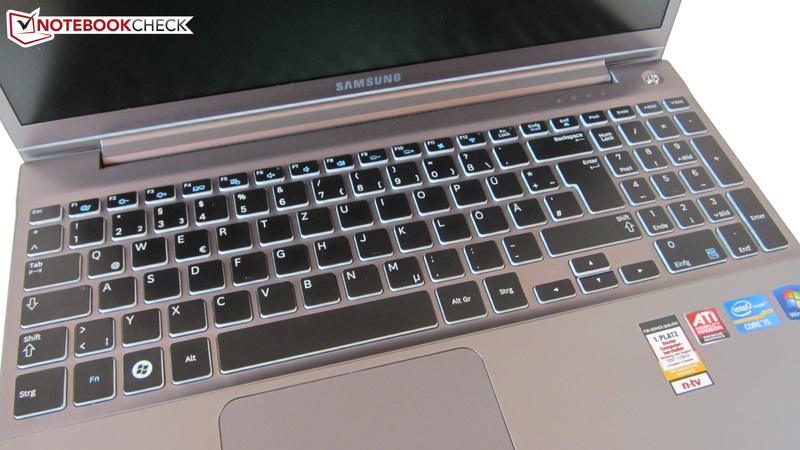 Samsung has done a good job with the input devices. It starts with the keyboard that not only has a variable (white) light, but also free-standing and adequately sized keys (15x15 mm). 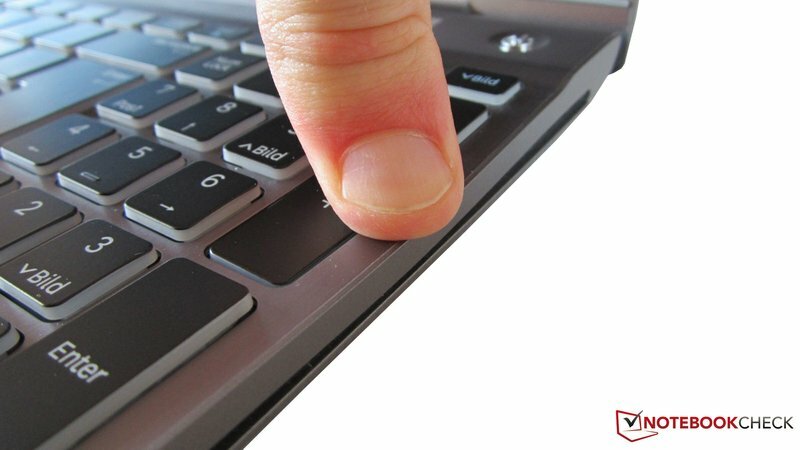 The pressure point and stop are good and hardly anyone will have anything to complain about in terms of typing noise. The layout is also well thought out - it's possible to accustom quickly. Merely the small arrow keys would annoy us in the long run (only 8 mm in height). The dedicated numpad can at least compensate a bit for this flaw. 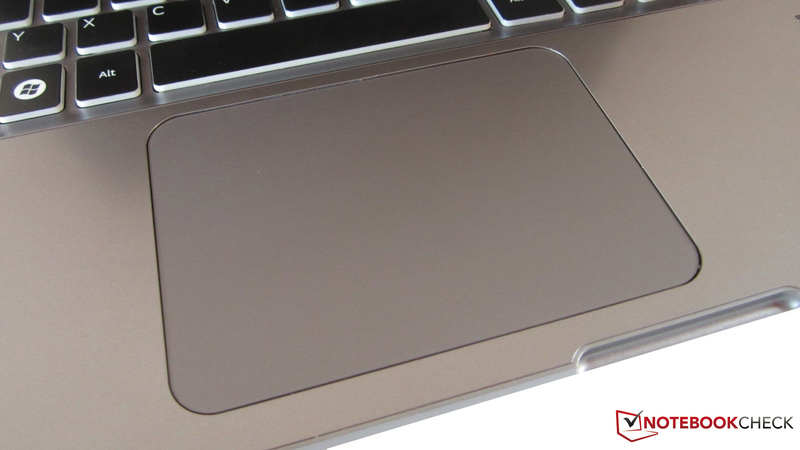 The marginally submerged touchpad especially scores with a generous size: 107x77 millimeter enables the user to manage even longer screen distances without having to readjusting the finger. 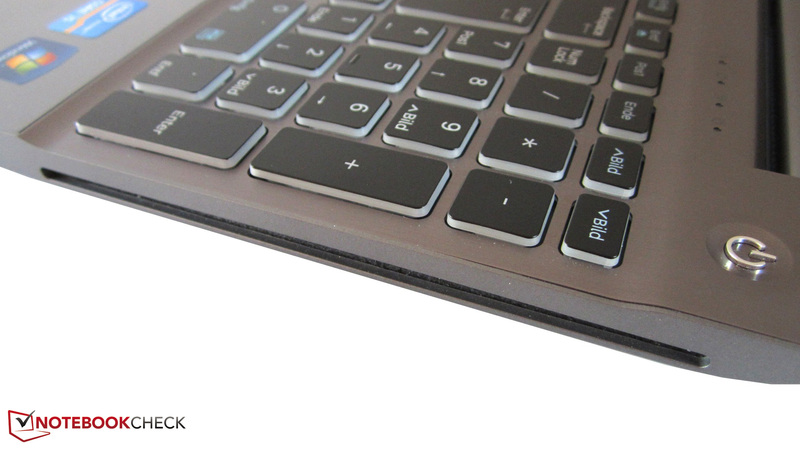 Another bonus point is the sleek surface which allows a very smooth gliding. 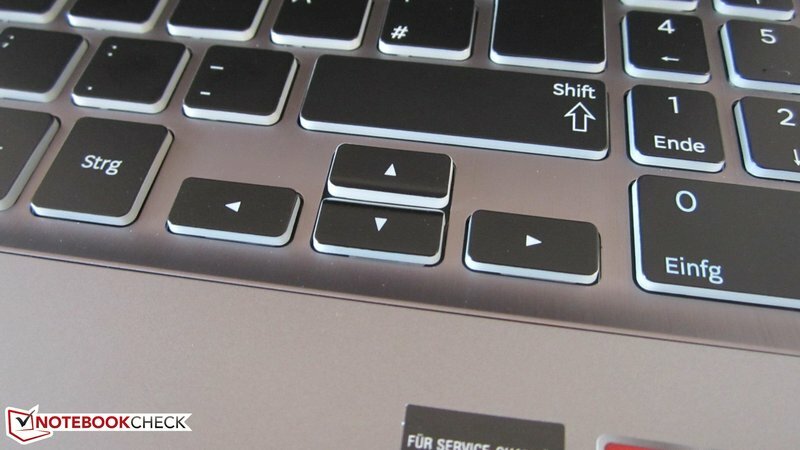 The keys incorporated into the touchpad are a bit unusual. While they cause the odd misentry at the beginning, they can be used properly after a while (we would have preferred separate keys anyway). 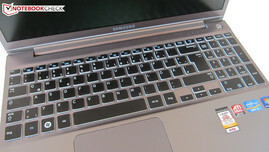 In order to facilitate daily work, Samsung builds in a multi-touch capable model with gesture control (zoom, scroll, etc.). 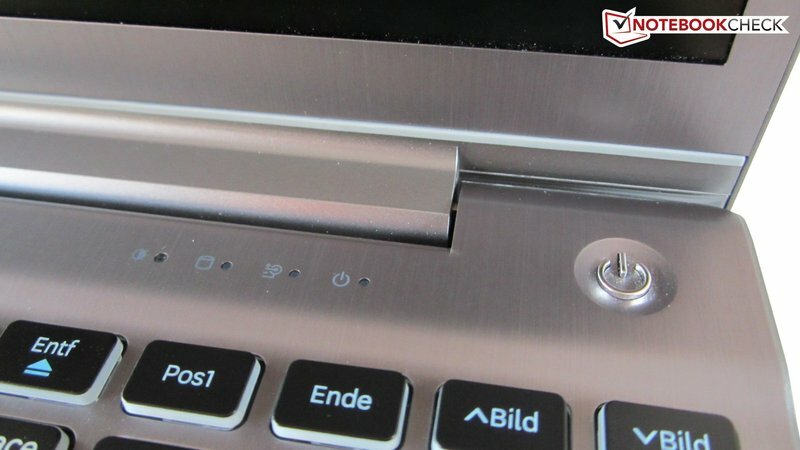 If desired, a horizontal and vertical scroll bar can be enabled on the touchpad's edge in the driver. 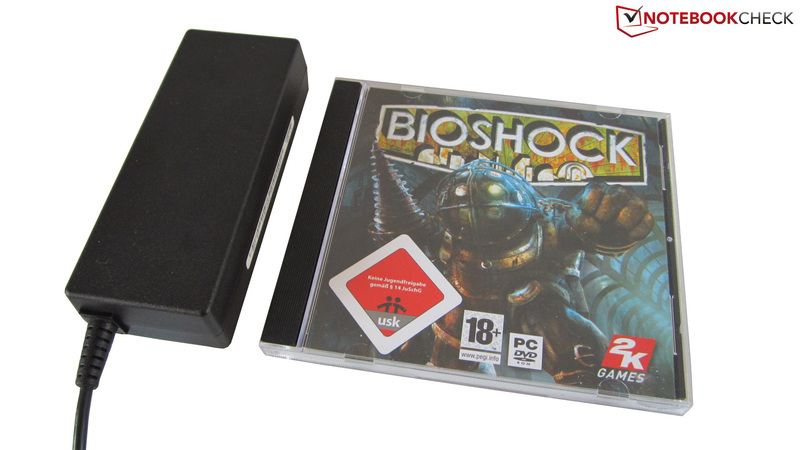 However, the deactivation option comes in handy for the gaming mode with an external mouse. There is at most room for improvement in the accuracy. The touchpad sometimes responded a bit spongy in the test. At first glance, Samsung doesn't slip up with the screen. The non-glare screen (LTN156KT068), in a 16:9 aspect ratio, has an LED backlight and a HD+ resolution. 1600x900 pixels are a good compromise in view of the display size and video performance. The automatic brightness control and the "Movie Color Enhancer" make it unnecessary to permanently readjust the screen in every single surrounding. This euphoria quickly dissolved again after we finished with our measurements. The biggest flaw is likely the high black value of 1.7 cd/m2. Dark picture elements look extremely gray, which is especially noticed in games and movies. The rate would have to be below 0.4 cd/m2 for a saturated black. The contrast is also below-average with 158:1. The colors can't be called intense. The sRGB spectrum isn't even close to being covered (see screenshot). The picture looks extremely pale and thus it's recommendable to use an external monitor for multimedia consumption. In return, the high luminosity is praiseworthy. We determined an average of 247 cd/m2 - a good result. Note: The measurements were made with i1Display 2. An update made with the more exact Gossen Mavo will follow. 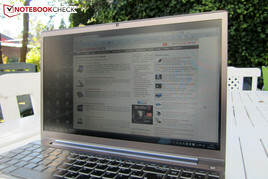 Thanks to the matt surfaces, the multimedia notebook can be used well outdoors. It's possible to work properly with the device even in intense sunlight. To spare the eyes, the brightness should even be reduced a bit indoors. Reflections are hardly an issue unlike the glossy representatives. The viewing angle stability is - to say it carefully - quite poor. 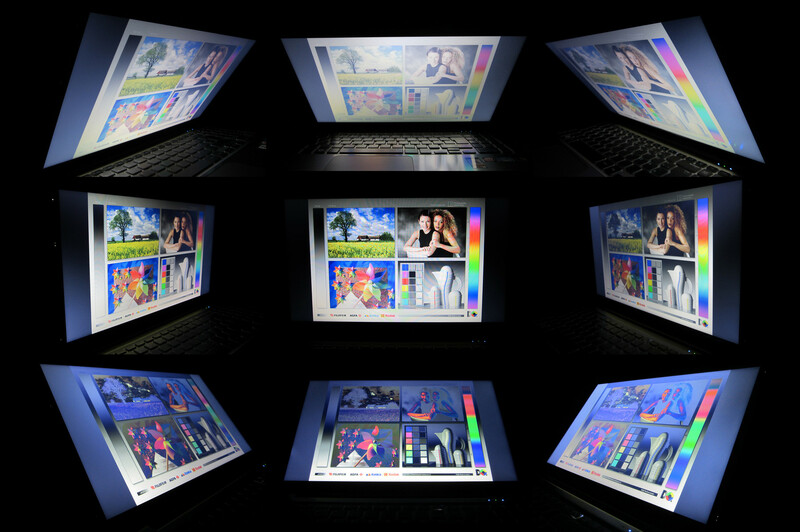 The brightness changes massively when deviations from the optimal point of view are made. A movie night with several friends shouldn't be at all considered. Unfortunately, frequent readjusting will be the order of the day. Intel's brand new Core i5-2430M processor is used in the Chronos 700Z5A-S01DE. The dual core is based on the efficient Sandy Bridge architecture and runs with 2.4 GHz. 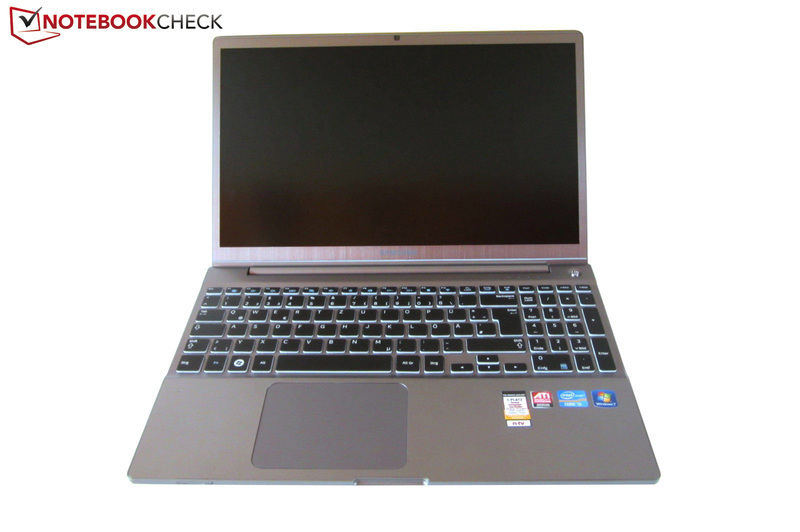 It replaces the popular Core i5-2410M. Depending on the load, the clock is increased to a fairly lush 3.0 GHz dynamically ("Turbo Boost"). Alike its predecessor, it is manufactured in a 32 nm process and contains 624 million transistors and a three MB L3 cache (Core i7-range: maximum of eight MB). Additionally, a few applications benefit from the Hyper Threading Technology. It supplies every physical core with a virtual counterpart. Thus, the dual core can process four threads at the same time. Another treat is the embedded graphics chip called HD Graphics 3000, which calculates relatively slowly, but allows an energy graphics switching in return. As long as the core count is a secondary matter, the Core i5-2430M performs well. For example, the dual core reaches 4809 points in Cinebench R10 Single Core Rendering 64 bit. 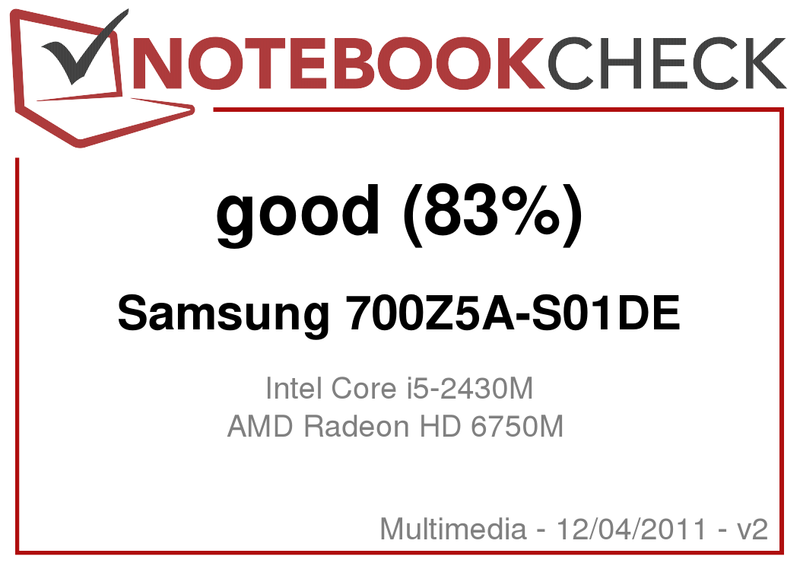 That is approximately on a par with the new quad core entry level Core i7-2670QM(4956 points @ Medion Erazer X6817). When an application strongly benefits from several cores, the i5-2430M loses ground. It falls behind by a whole 45% in Multi Core Rendering with 18243 to 9991 points. As our Sandy Bridge comparison shows, the difference in normal (gaming) operation is a lot lower. 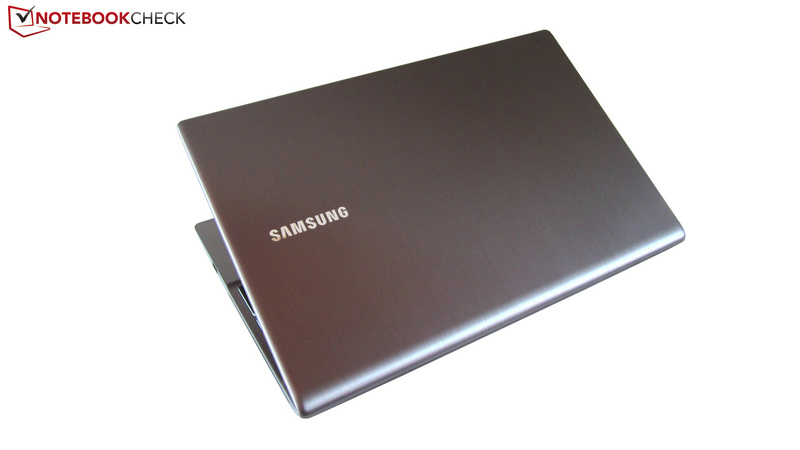 It is remarkable how Samsung has managed to build in an upper midrange graphics card into such a flat case. The Radeon HD 6750M is a DirectX 11 capable graphics accelerator from AMD. It is manufactured in a 40nm process and can boast with 480 unified shaders and a 1024 MB GDDR5 VRAM (128 bit interface). While the core runs with 600 MHz, the shaders and memory clock with 800 MHz. Thanks to the UVD3 technology, the graphics card is able to decode high definition videos, which relieves the CPU of some workload. The Chronos 700Z5A has automatic graphics switching so that the user can spend a longer time away from the power outlet. It activates the embedded Intel GPU instead of the dedicated Radeon GPU during less computing intensive tasks, such as office or Internet. Unfortunately, AMD's fairly new switching technology is still struggling with a multitude of teething troubles. In addition to the few intervention possibilities, the few visual notifications, lack of convenience functions and the modest program database are particularly annoying. Thus, there were various benchmarks and games in the test, which the system would have started with the slow Intel GPU if they hadn't been set manually (see screenshots). To make things worse: Single programs (3DMark03, Cinebench & Furmark) absolutely refused to run on the Radeon even when the driver was modified. Nvidia's counterpart, Optimus, is far more reliable and less error-prone in a direct comparison. Or to say it differently: AMD has to make major improvements within the next few months to successfully compete with Nvidia. The graphics switching is still too undeveloped for avid gamers at the moment. We checked the Chronos 700Z5A's DirectX 11 performance with 3DMark 11 among other software (1280x720, presetting performance). With a GPU score of 1169 points, the Radeon HD 6750 is very close to its greatest Nvidia rival, the GeForce GT 555M (1099 points @ Schenker XMG A501). In return, the Nvidia GPU has a 14% lead in the demanding Unigine Heaven 2.1 benchmark (1280x1024, high, default tessellation, 16.8 vs. 14.8 fps). Basically, both cards are about on a par, whereas the GT 555M has a slight advantage. Contrary to the specifications found in various online shops, our test device isn't equipped with a 500 GB, but rather a 750 GB hard disk. The Hitachi HTS727575A9E (7200 rpm) belongs to the faster members of its kind. Sequential read and write rates of nearly 110 MB/s are above-average (CrystalDiskMark). According to HDTune, the average access speed of 16ms is good. However, a unique feature is a technology called "Express Cache", which ensures fast booting. Like a case sticker correctly states, the Windows desktop appears after about 19 seconds. This is made possible by a small, eight GB SSD from SanDisk (iSSD P4). This is a nice feature that we would like to see in more devices in future. By the way, the hard disk isn't directly accessible. Samsung only allows its customer to access the RAM. As expected, the Chronos 700Z5A doesn't break any records in the system benchmarks. 7118 points in PCMark Vantage are good, but not outstanding. In comparison: The 17 inch HP Pavilion dv7-6101eg only manages 6648 points despite the same components (Core i5-2410M & Radeon HD 6770M). In return, the aforementioned Schenker XMG A501 (Core i5-2410M & GeForce GT 555M) reached over 10000 points with a "real" SSD disk. Naturally, the gaming performance is also part of the review. Four of the latest tracks are to supply an overview. Although EA has set up a very dubious online platform together with Origin, Battlefield 3 is being sold like hot cakes. The publisher has declared that more than five million copies have already been sold worldwide - awesome! But back to topic: Battlefield 3's striking visuals are paid for with hefty hardware requirements. Medium or even high details are in no way possible. The first person shooter only runs fairly acceptable on the lowest level (34.6 fps @ 1024x768). But this circumstance isn't that fatal because Battlefield 3 still looks pretty good even in minimum settings. Maybe a graphics driver update can draw out a few more frames at a later date. The Formula 1 reference, F1 2011, doesn't demand quite as much from the Chronos 700Z5A. While a combination of high details, two times antialiasing and 1366x768 pixels stutters a bit due to 29 fps, medium details and 1024x768 pixels are rendered very smoothly (48 fps). Medium details are the maximum to be selected in the native resolution, whereas the DirectX 11 mode has to generally be excluded. Despite its rather second-rate looks, Deus Ex 3 craves for a strong graphics card. When the resolution is reduced to 1366x768 (the screen interpolates quite well), the first person shooter can be enjoyed with Edge AA, four times antialiasing, medium details and enabled DirectX 11 (39.3 fps). However, the GeForce GT 555M doesn't stand a chance against the Radeon HD 6750M: The Asus N75SF is nearly 30% faster in these settings (51 fps). Technically undemanding tracks like Fifa 12 don't upset the Radeon HD 6750M. A mix of 1920x1080 pixels, high details and four times antialiasing leads to a smooth as silk 50.6 fps. It becomes clear that the soccer simulation favors the Nvidia graphics card in a comparison with the Asus N75SF (Core i7-2630QM & GeForce GT 555M), which achieved twice as high 96.8 fps in the test. Casual gamers who don't have a problem with playing in medium details and reduced resolutions every now and again will likely be happy with the Radeon HD 6750M. Although the power is rarely enough for the best possible looks and the use of antialiasing. Older and resource sparing games can often be played in high details. 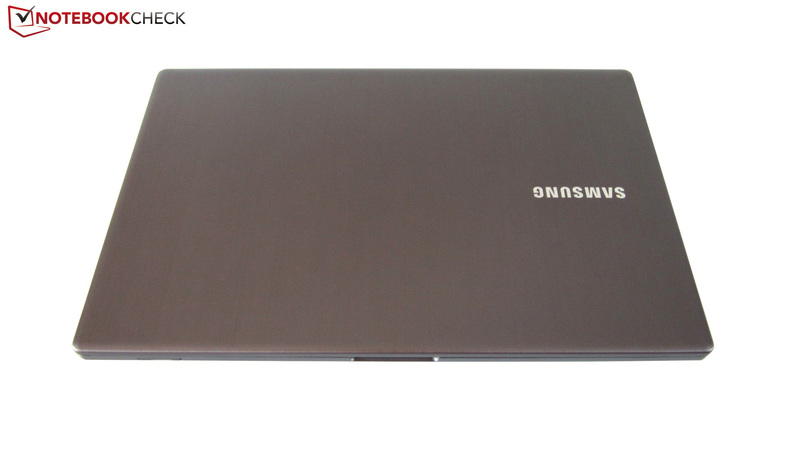 Samsung wouldn't have been able to implement more power because of the slim build anyway - kudos for that. There is not much need to worry about the soundscape. The hard disk is primarily heard in idle mode. It emits a consistent, but not disturbing noise. Except for a sporadic increase, the fan stays in the background (Silent Mode can be enabled via FN + F11). Movies can be enjoyed perfectly since the optical drive's noise is acceptable in terms of loudness. The situation changes fundamentally in high load. During games, the fan rotates on a clearly audible, high-pitched level and, to make things worse, it likes to change its speed. However, the game's soundtrack is only sometimes drowned out depending on the genre. Overall, the noise development isn't perfect, but most users will still find the noise tolerable. The temperatures are also typical. We can particularly record a temperature increase in the fan area during gaming: A maximum of 42°C on the top and a maximum of 43°C on the bottom won't exactly be pleasant in the long run. The WASD area that is important for gamers is also fairly warm with up to 39°C. 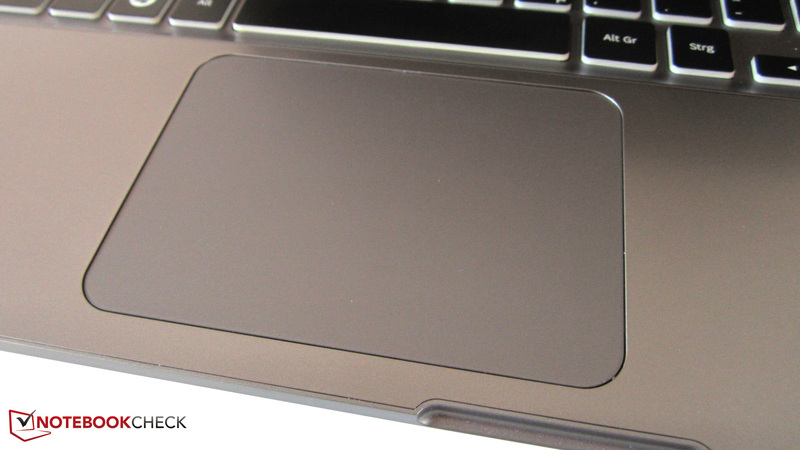 We quite liked the wrist rest that remained below 30°C even during load. The laptop isn't quite as hotheaded when idling - about 28°C are acceptable. We couldn't execute the component stress test because the tool Furmark refused work with the Radeon HD 6750M. In any event, the processor and graphics card behaved normal in daily routine. (±) The average temperature of the palmrest area of similar devices was 29.1 °C / 84.4 F (+1.3 °C / 2.4 F). Both built-in speakers unfortunately can't generate a good sound. On the one hand, the sound is fairly vague, tinny and hollow. On the other, the deep pitches can't come into their own due to the lack of a subwoofer (hardly any bass). We were pleasantly surprised about the maximum volume. A few modes for modulating the sound according to the various scenarios, such as movies or music, can be found in the "Easy Settings" tool under "Sound Alive". Nevertheless, we would recommend using headphones or external loudspeakers. The Chronos 700Z5A is light-years away from the sound quality of a Dell XPS 15 or an Asus N55SF. There is no need to fear high electricity bills with the Chronos 700Z5A. 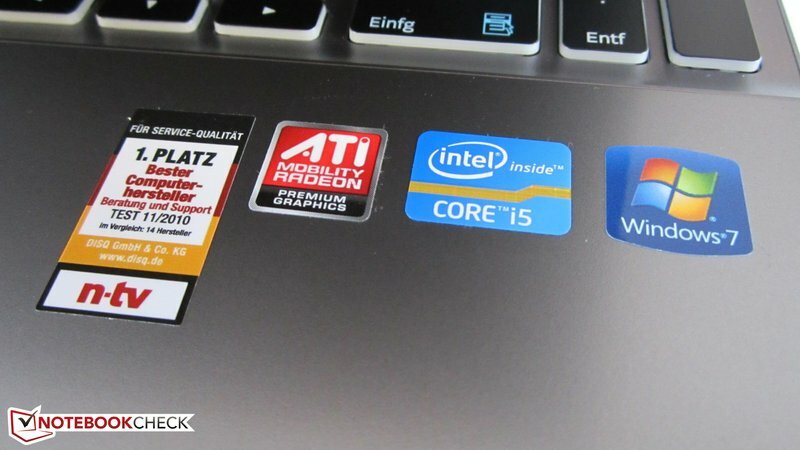 Due to the automatic graphics switching, the 15 inch laptop only consumes about 15 watts in idle mode. The load consumption of nearly 70 watts is also absolutely acceptable. 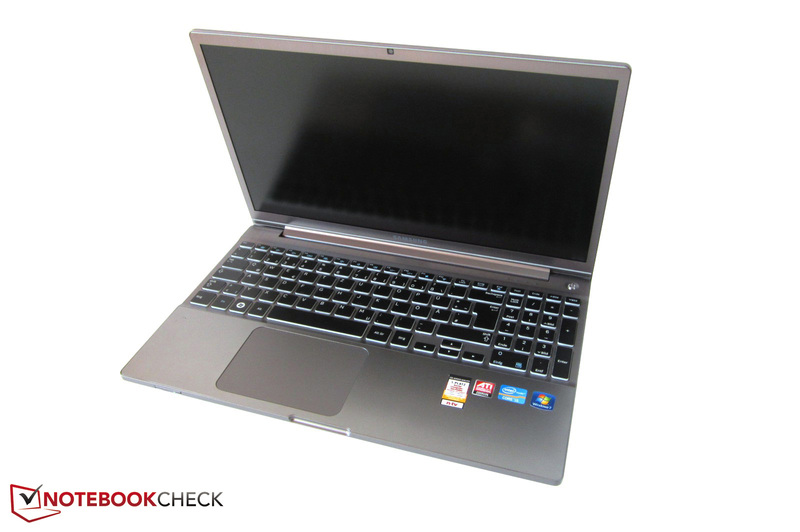 The similarly fast XMG A501 from Schenker Notebooks needs a bit more power here (see review). 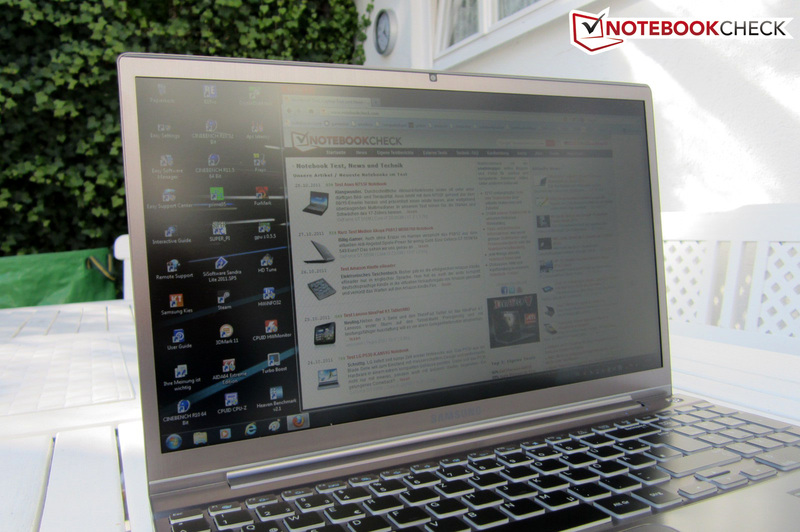 The excellent battery life is the biggest strengths of the multimedia notebook. The permanently built-in 8 cell model allows the user to make nice and long excursions. While many opponents give up after only an hour, the Chronos 700Z5A still lasts 2 hours (maximum brightness & disabled energy saving options). When the notebook isn't put under such high load, the runtime increases significantly. Playing a DVD is possible for about five hours with medium energy saving mechanisms and maximum display brightness. We could surf wirelessly on the Internet for about six hours. The 15 inch device even almost surpasses the 10 hour mark under optimum conditions (minimum brightness & maximum energy saving options). In our opinion, Samsung can file the Chronos 700Z5A under success. The unusual blend of powerful components and slim build are hard to find among the competition. 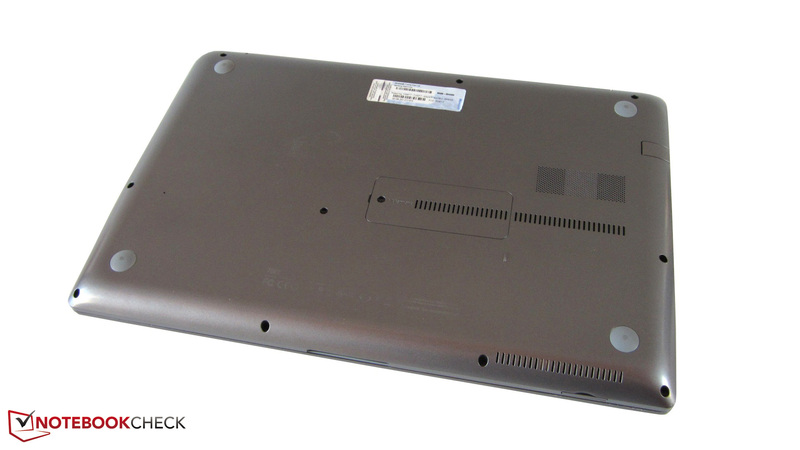 The 15 inch and 2.4 kilogram light case scores with an elegant design, an illuminated keyboard and a big touchpad. Small details, such as the compact power adapter, fast booting (thanks to "Express Cache") and the convenient "Easy Settings" tool, make for a coherent overall picture. The absolute highlight for us is the great battery life: Six hours aren't a problem during normal tasks (incl. maximum brightness!). Noise and temperature are still reasonable and users who aren't exactly overly sensitive will be able to live with the emissions. The list of cons is rather short. Beside the modest maintenance options, the quite Spartan connectivity and the wobbly lid, the insufficient case stability would have to be especially pointed out here. In particular, the top yields extremely under strong pressure. However, the display's inferior quality annoyed us most of all: Black value, viewing angles, colors and contrast lagged far behind the expectations. Samsung blunders heavily in this respect and it lets the rating drop by several points. 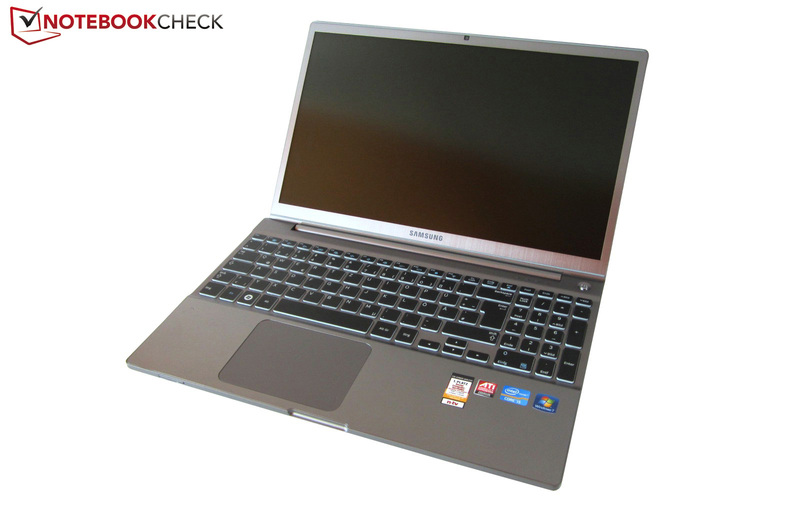 The Chronos 700Z5A is thus sooner aimed at the mobile office and Web user than at the games and movie interested entertainment aficionado. Users who don't put high expectations on the screen can unhesitatingly take the Chronos 700Z5A. 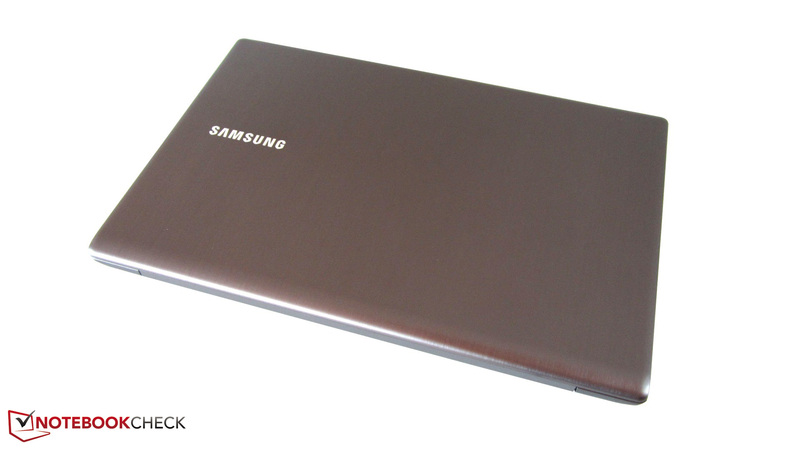 Samsung has opted for a silver-gray color. The black keys set a nice accent. The arrow keys could do with a bit more height. Samsung relies on midrange hardware. The notebook isn't exactly rugged. The wrist rest conceals a microphone. The keyboard hardly gives reason for complaint. The touchpad is surprisingly large. Naturally, a Samsung logo shouldn't be forgotten. There is only a card reader on the front. The right has one USB 2.0 port. A slot-in drive is hardly seen in notebooks. 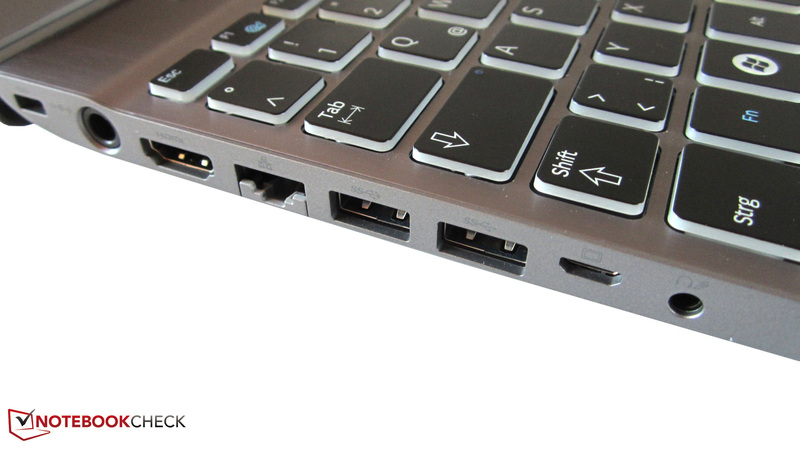 Two USB 3.0 ports are located on the left. The 90 watt adapter even fits in a pocket. 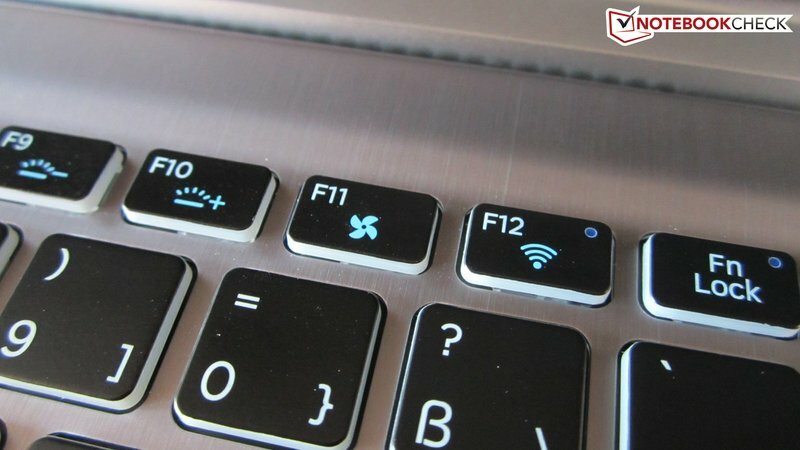 A silent mode can be enabled via a key combination. Fingerprints aren't an issue on the Chronos 700Z5A. The fan outlet is hidden underneath the hinge. Thanks to the matt finish, the surfaces hardly smudge. The laptop is fairly light for a 15 inch device. The display bezel is unusually narrow. The notebook only has a height of 25 millimeters. The maximum opening angle is fairly narrow. There are no interfaces on the rear. 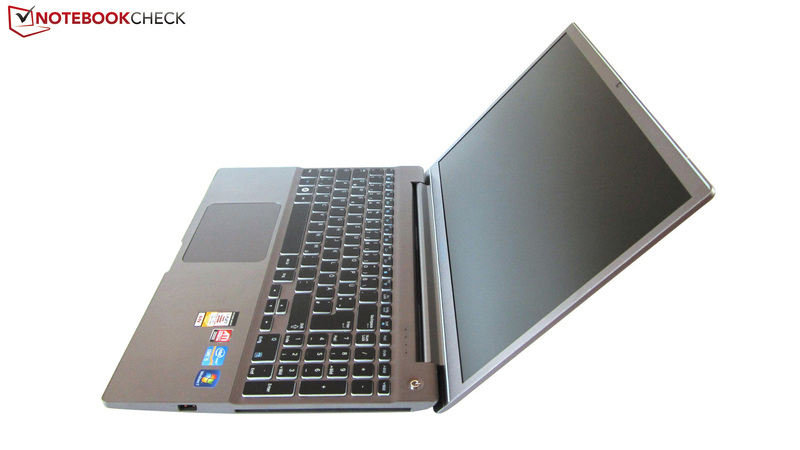 The 15 inch laptop makes quite an elegant impression in terms of looks. 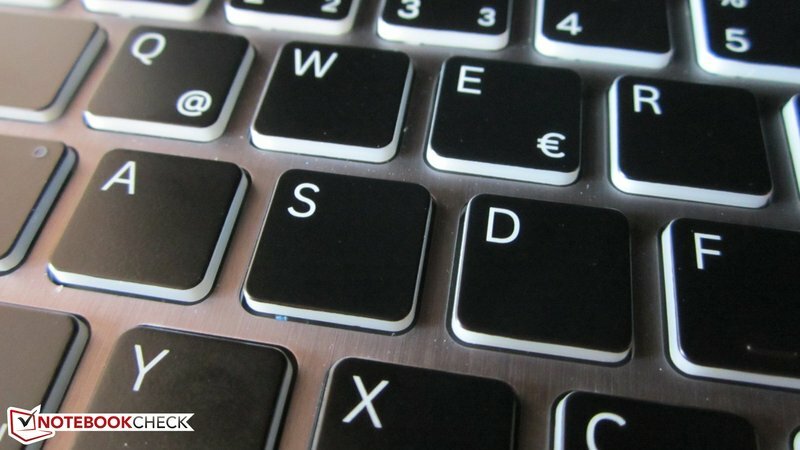 The keyboard can be illuminated if desired. Samsung only allows its customers to access the RAM. The left accommodates most interfaces. The optical drive doesn't have a tray. What would a laptop be without a webcam? A VGA adapter and a recovery DVD belong to the scope of delivery. 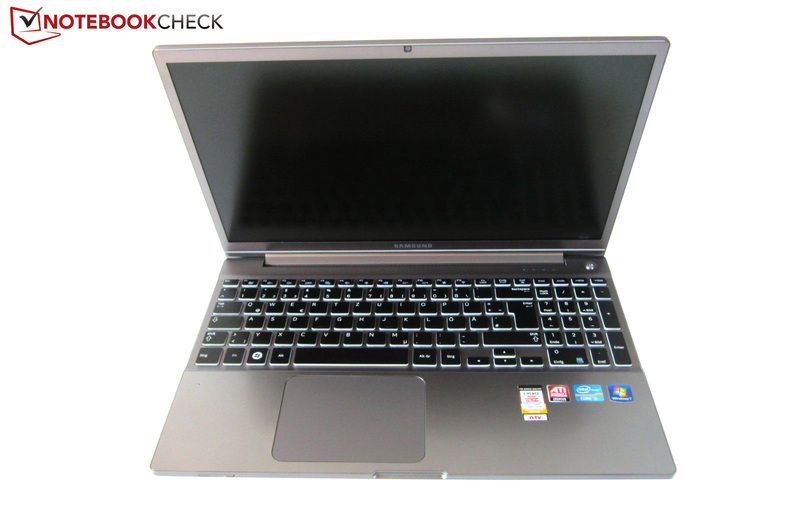 The great battery life, the good input devices and the elegant design. Samsung should have paid more attention to screen quality. Powerful midrange hardware in a slim and fairly light case. 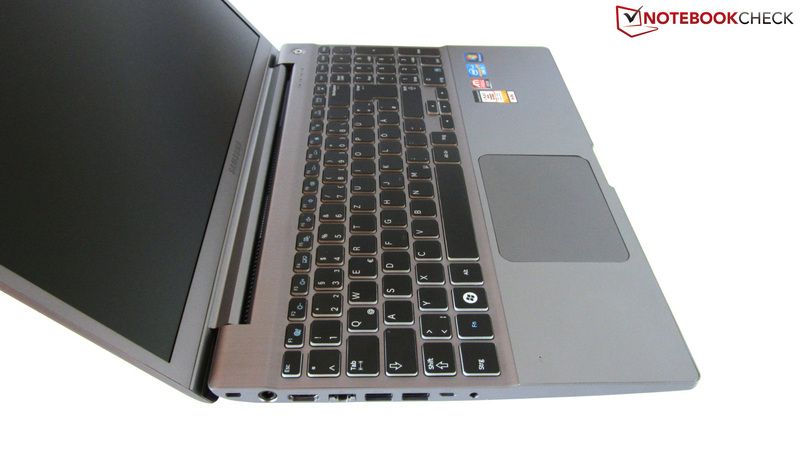 15 inch, versatile laptops based on Sandy Bridge, such as the Asus N55SF, the Asus N53SN, the Acer Aspire 5750G, the Apple MacBook Pro 15, the Dell XPS 15z, the Gigabyte P2532N, the LG P530, the Medion Akoya P6812, the Medion Erazer X6815, the Packard Bell EasyNote TS11, the Samsung RF511, the Samsung RC530 or the Schenker XMG A501.